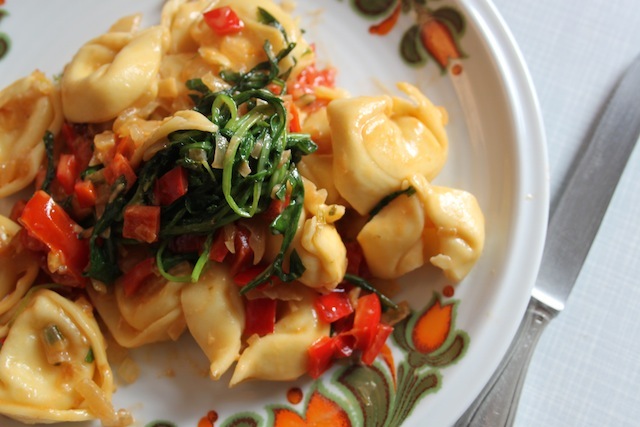 The Not All At Once Approach: Pasta with Tomatoes & Arugula – Eat Me. Drink Me. I’m not good at change. Anyone who’s ever asked me to make a decision quickly knows this. It takes me time to think things through. Not necessarily to weigh the pros and cons of a new course of action – but just to get used to the idea of something different. As a human, I am a huge proponent of the not all at once approach. Tell me something new, but don’t tell me all at once. This is also the way I cook. I believe ingredients need time to understand themselves as they melt into a hot skillet – an onion doesn’t want an eggplant until it’s ready. And when they meet, they need time to get to know each other. To feel comfortable as a unit before tomato comes along. Cooking like this takes longer. But it makes sense to me. One at a time, piece by piece until the composition of the pan has changed. Until it is a full pan, not an empty one. This recipe is about not rushing. It’s very easy and doesn’t take long to make – but it needs a gentle hand. Finely chop onion and sauté in olive oil and brown sugar in a skillet until onion is translucent. Add sweet red pepper (I prefer the mildness of a Hungarian pepper) and cook until softened. Add chopped sundried tomatoes with a splash of the oil they were in (or more olive oil if you’re using dry tomatoes) and a healthy pinch of salt. Stir for a few minutes. Add cherry tomatoes and cook until softened. Add green onion and garlic. Lastly, add a generous handful of arugula and basil until the greens have wilted. Season to taste with salt and pepper. In the meantime, have set a large pot of salted water to boil, and cook as much pasta as you (& others – though this recipe was ideal for 2) plan to eat. 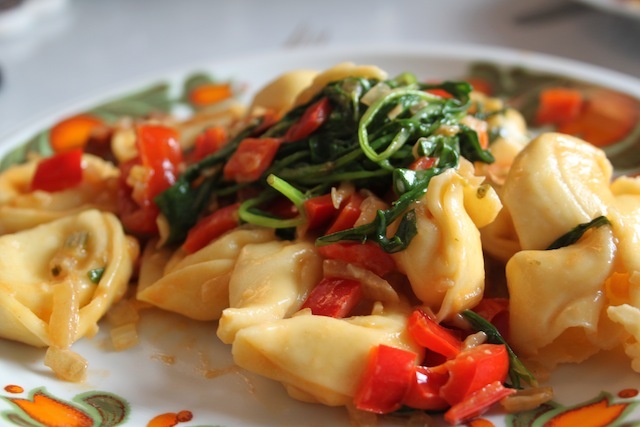 When the pasta has cooked, drain it, then add it to the skillet of vegetables with butter and heavy whipping cream. Toss the pasta with the sauce and cream until coated and the cream has cooked up a bit. 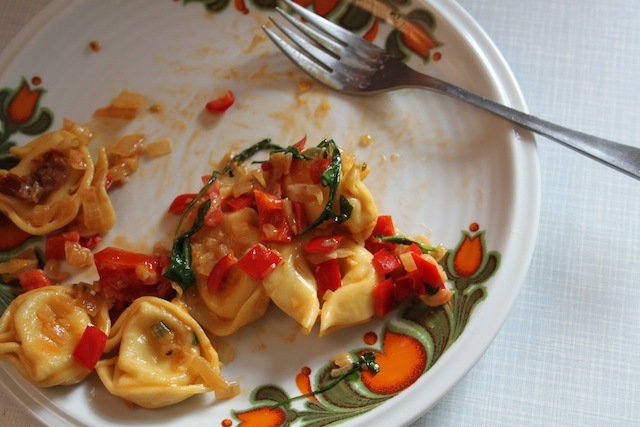 You can use any sort of pasta with this recipe – and add other vegetables as you see fit, but I like the simplicity of just tomatoes and greens. 1. when you come back to the USA, you are coming to my house to cook me a meal or several. I will pay. 3. I now own a smoker and am currently smoking some mullet (childhood delight from our days at the beach with the parents – near impossible to find anymore). With my smoker, I have found an entirely new way to cook – slow and slower. With that splurge of information, you need a few stories on smoking food (not dope). 2. See 3. + 1. 3. Let’s smoke some things. Food things.